Sorry for the lack of cupcakes yesterday, but I had so much on! I'll catch you up for my finale of baking week very soon I promise. 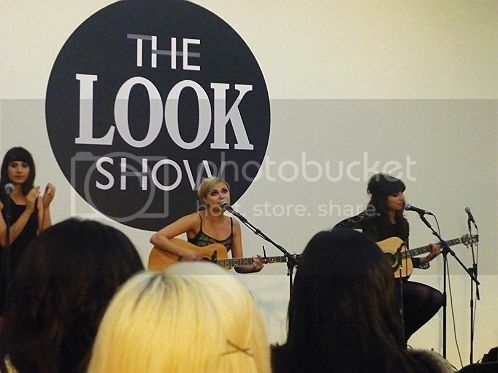 But I want to give you all my rundown on The Look Show, which I went to on Friday. This was my second show, as I luckily won a last minute ticket with Monsoon and Accessorize, and I asked the darling Lauren from Pocket Rocket Fashion to come as my plus one. We were originally going to be meeting Nicolette and Sakina in Harrods for lunch, as they were in the city to interview Beth Ditto about her new collection at Evans. Sadly, they'd moved on by the time my VERY SLOW BUS arrived in Knightsbridge. 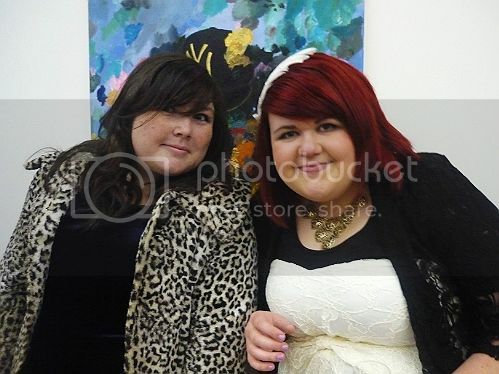 But c'est la vie, me and Lauren grabbed some sushi then headed over to the Saatchi Gallery. I chatted away to them later and they were all very nice. Other live performers were Shayne Ward, Gabrielle Cilmi and Diana Vickers. I got WAAAAY too excited to meet the teenager who lives across the road from my friend, Claire. But for those of you not from the UK - this is Joe McElderry who won last year's X Factor, and he's from my hometown of South Shields. 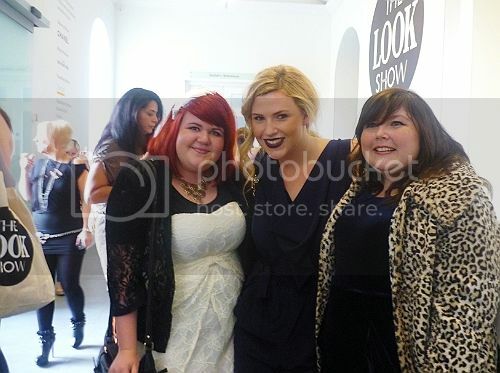 With plus-size model Hayley Morley. She was SERIOUSLY beautiful and had curves to die for. As always - River Island push the boat out for High Street clothes that look a lot more expensive than they actually are. Last season at The Look Show, they seemed to have a fantasy/Alice In Wonderland theme, but this time there was more of a rock chick vibe going on - with lots of party dresses toned down with casual leather, sheepskin and faux fur jackets and cardigans. When I think of New Look, I think of floaty summer dresses and boaters for S/S and lots of black and sparkles for A/W. But they really surprised me! The collection they showcased had lots of structured peices - double breasted coats, nipped in waists and high collars. I absolutely adore this look, it's very Victoriana. Oasis showcased some very grown-up glamour with a lot of vintage influences. Like New Look, there was a lot of focus on necklines - from high polo necklaces to a plunging sweetheart neckline on a stunning black maxi. Snoods were very popular last year, but they seem to have been 'upgraded' this year to vintage inspired faux fur collars and stoles. They add instant glamour to any outfit - and will definately keep me warm during nights out! 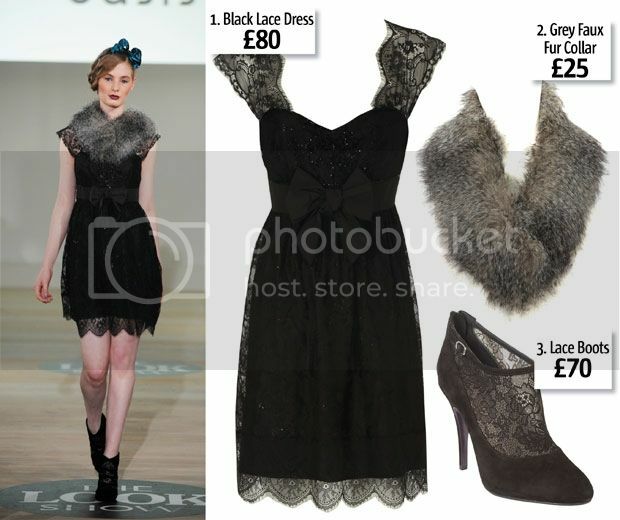 Remember that all these peices are available instore now - and you can stop directly through Look.co.uk. The Lady Grey dance troupe did a fabulous jazz dance with The Look Shoe collection, which is a collaboration with Office. 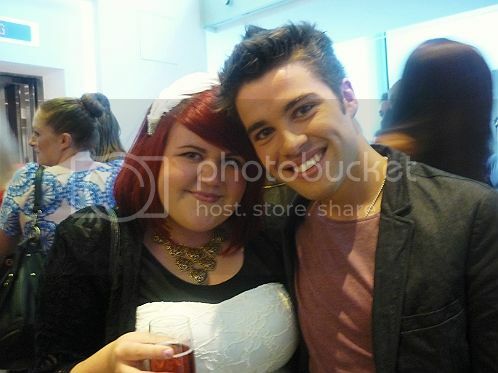 They looked stunning, and they were so adorable when we met them afterwards. I've only posted the latter pictures, since the first two are actually horrendous. 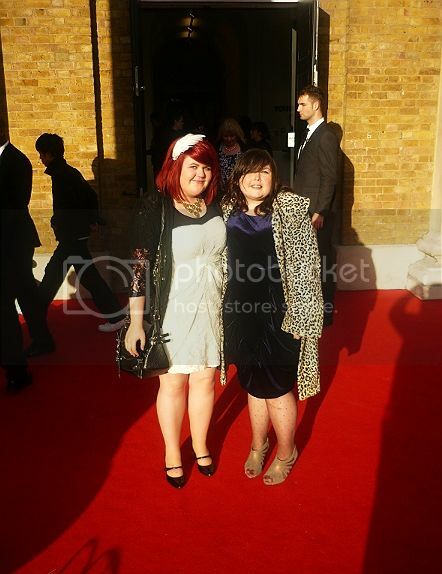 There was an option of 'WIND MACHINE' which is why we look more windswept than interesting. 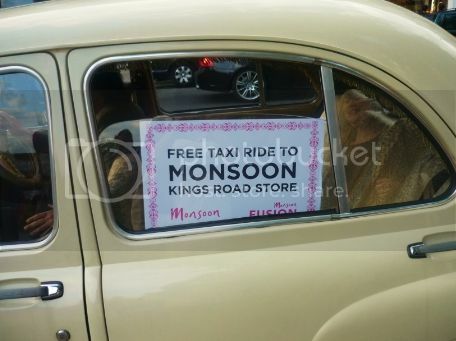 After the show, the lovely Amy from Monsoon (who coincidentally is a blogger herself - be sure to check out These Girls Turn Heads) had arranged for us to get into their 'Karma Cab' to drive to their Kings Road store for an aftershow shopping trip. I renamed the 'Karma Cab' the ' Camp Cab' as it was decorated in flock, ribbons and even had a mini chandelier in the roof. 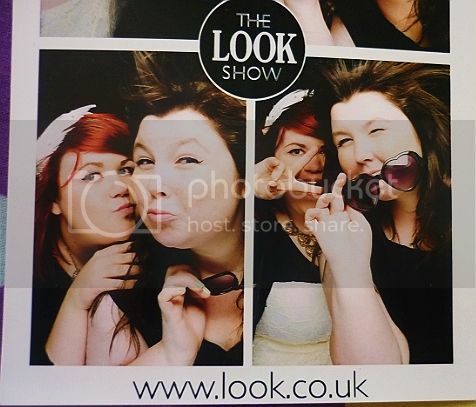 Because we'd been to The Look Show, we could get 20% off everything. 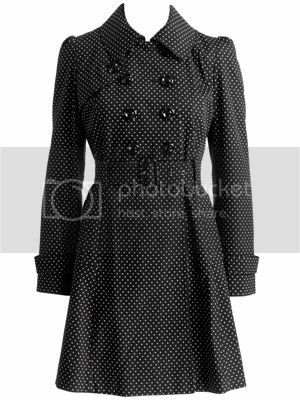 I've been looking for a nice winter coat for a while now, and picked up this stunning polka dot trenchcoat from the Monsoon Fusion Collection. RRP £80 but I got it for £64. I'll post a proper picture of me wearing it soon, but it's like it was made for me! It hugs my breasticles and bumbum, nips my waist and stops just above my knees. 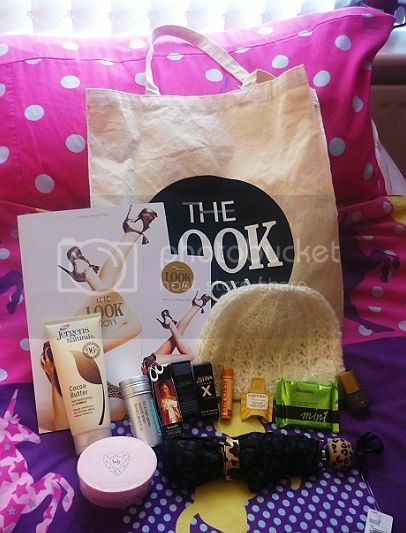 Jergens cocoa butter, Toni & Guy smoothing serum, Benefit lipstick, Jean Paul Gaultier samples, Burts Bees lipbalm and day cream, Thorntons chocolate, Dorothy Perkins white beanie hat, Accessorize nail polish, Marks and Spencers leopard print umberella and Westwood Rocks hairpin. 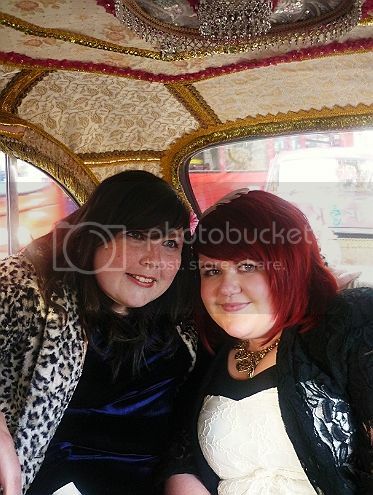 Miss Lauren's velvet dress is from Beth Ditto's new collection at Evans and is just beautiful on her! If you read through all this - you deserve a medal. Or at least a good cup of tea. Thank you again to Amy and all the Monsoon team for taking good care of us. And of course to Lauren for being an awesome plus one - next time I'm in London we'll have to party methinks. haha... your breasticles. <3 i love you. You both look gorgeous! I especially love the wind machine photo! Wow what a great show! And beautiful outfits, both of you! You both look great, love your outfits! I am so massively jealous of your coat! It's gorgeous and I bet it does fit like a dream. The River Island outfit is stunning! Both of you look fan-tabulous (fantastic and fabulous?) and it looks like you both had much fun! Looked like a lot of fun. Enjoying reading and looking around your blog.